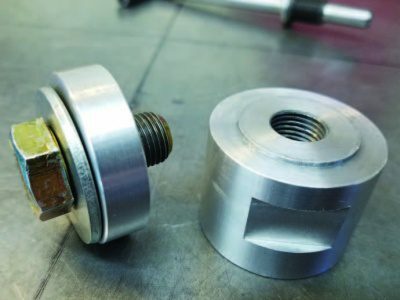 In last month’s issue I showed you how to make a piston stop tool. 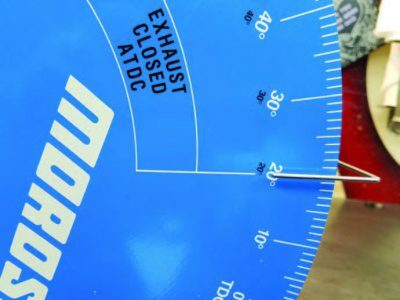 A piston stop tool is used to find Top Dead Center, commonly referred to as TDC. So, we made the tool, now we are going to put it too use. The TDC tool is a valuable tool to have in your toolbox. 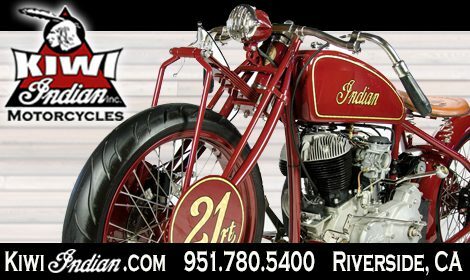 It will aid in the proper timing of your engine, valve lash adjustments, setting points, degreeing cam shafts, and also it is necessary to find TDC when you upgrade to new engine parts that no longer have the timing marks on them. The first thing that I like to do is remove the spark plugs from the engine. Then bring the #1 cylinder to the top of its stroke visually. I use a flashlight, so you can see what is going on. The engine I am using in the article this month is a Yamaha XS650. But what I am showing you can be applied to any engine. 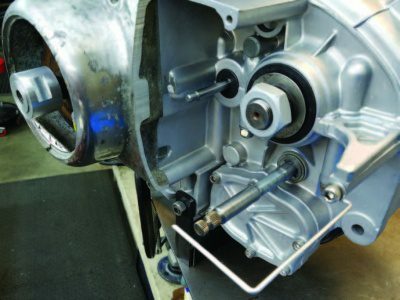 Its best to find a way to rotate the engine over slowly and smoothly. As what we are getting ready to do is precision. The electric start and or kicker pedal is not going to work for this. A socket and ratchet on the crankshaft works for this particular engine. You are also going to need a degree wheel. They come in many sizes. From small to large. 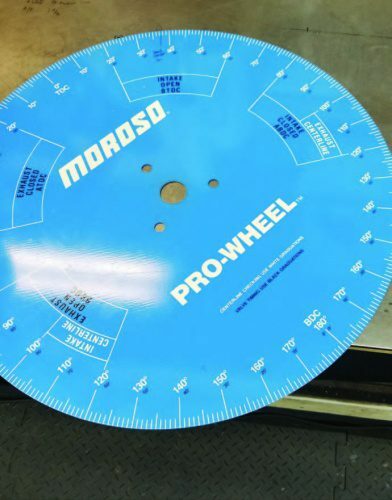 The larger the degree wheel the more accurate. I prefer the largest degree wheel that I can find. They are much easier to read with accuracy. screws onto the end of the crankshaft which then holds the degree wheel. A lot of times you can just get away with a couple nuts and a few washers. The smaller diameter degree wheels are more mount friendly. Because they have a smaller size hole in the center. will work here. The goal is to have it as steady as possible. Making it easy to read. We have already visually brought the piston to the top. 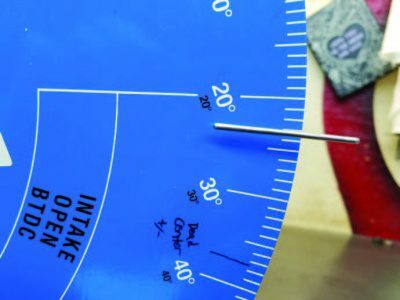 Now, you will need to adjust your degree wheel, so the pointer is at zero degrees. Then rotate the engine backwards before installing the piston stop. At least 30 degrees if not more. 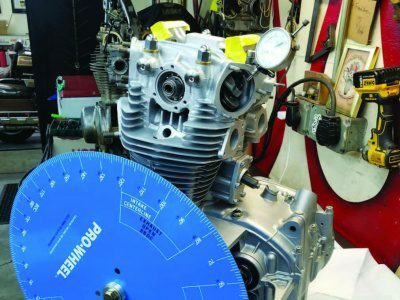 Now you can install your piston stop tool. 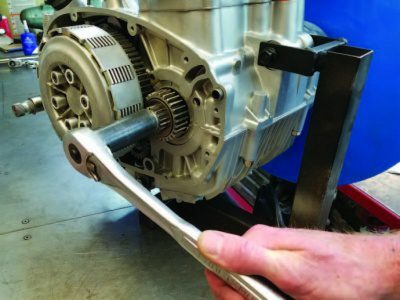 If at any time while using the piston stop tool you feel any resistance whether it be installing it or rotating the engine over, STOP IMMEDIATELY! The tool can damage the intake or exhaust valves. 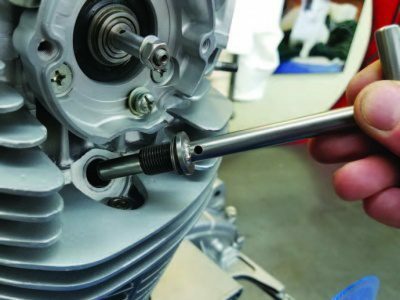 On a side note; Iwith the Yamaha XS650 engine have found that you need to remove all the lash from the intake rocker arm when finding TDC otherwise the intake valve will come in contact with the piston stop tool. piston stop. Now, record the number that shows up on the degree wheel at the pointer. 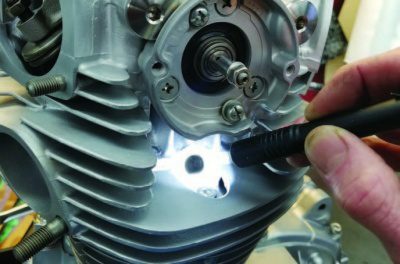 Next rotate the engine in the opposite direction all the way around until you feel the piston come into contact with the piston stop. Record this number. The next step is some basic math. 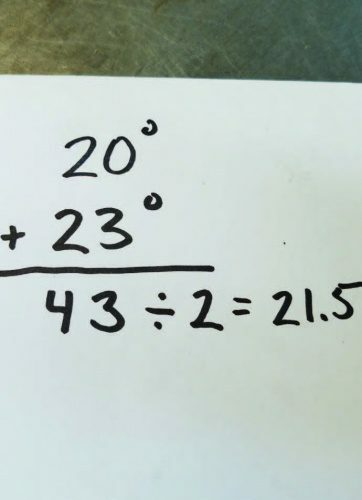 Add the 2 numbers you recorded together and then divide by 2. AFTER you get this number, you will want to loosen up the degree wheel and then rotate it to this number. 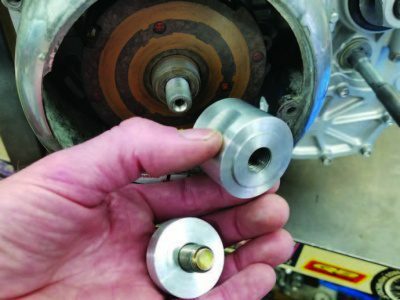 While NOT moving the crankshaft snug up your degree wheel holding nut. Again… While NOT moving the crankshaft. So, the key thing here is, you need to be able to rotate the engine back and forth. 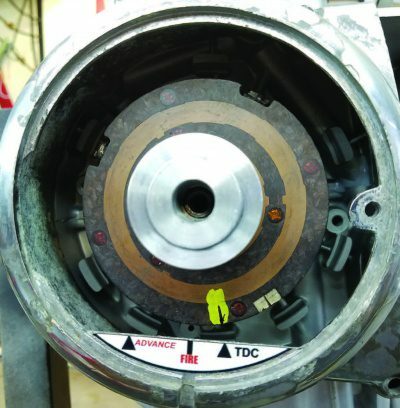 When the piston makes contact with the stop, it reads the same number on both sides of TDC. You may have to do this a few times then adjust the degree wheel accordingly to achieve that same number. Once this is accomplished you can then remove the piston stop rotate the engine to Zero degrees. THAT IS TRUE TDC! 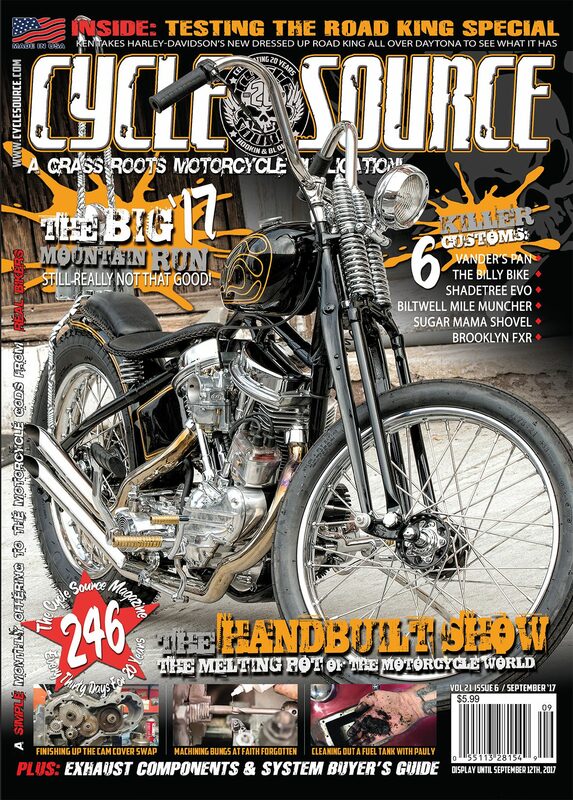 This entry was posted in Tech Tips/ DIY and tagged August 2018, Back Issue, Cycle Source, Cycle Source Magazine, Daniel Donely, Pandemonium Custom Choppers, TDC. True Dead Center, Tech, Tech Tips. Bookmark the permalink.